FILE - People walk through Red Square in Moscow. Given the choice, 20 percent of Russians would pack their bags and permanently move to another country, according to a newly released Gallup Poll. Their most preferred destinations: the United States and Germany at 12 and 15 percent respectively, while Japan, Canada and Spain shared third place at 5 percent apiece. "Adding to the bad news last month that Russia is dangerously close to a full-blown demographic crisis, with its population declining for the first time in a decade in 2018," the new benchmark "should concern Moscow," the report said. "Larger potential migration numbers could accelerate the population decline, and losses could potentially exceed the 8 percent of the population that the United Nations currently projects Russia to lose by 2050." More striking, the Gallup data show that the percentage of working-age Russians who say they would like to move "has at least tripled" since 2014, jumping from 14 percent to an unprecedented 44 percent among 15- to 29-year-olds, "and from 7 percent to 22 percent among those between the ages of 30 and 45." The percentage of those aged 46 to 60 who would like to live elsewhere went from 3 to 9 percent, the report said. Losing workers from all educational backgrounds and skill levels could wreak further havoc on Russia's $1.7 trillion economy, which is already plagued by underinvestment, broadening state ownership of enterprise and Western sanctions over Moscow's 2014 annexation of Crimea. 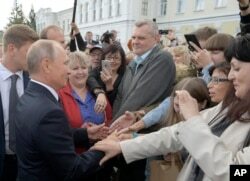 FILE - Russian President Vladimir Putin, left, greets local residents in Omsk, Russia, Aug. 28, 2018. The Gallup Poll also says President Vladimir Putin's job approval rating, which has been in steady decline since his 2018 re-election to a fourth term in office, may be "at least partly to blame" for the spiking desired migration trend. "Between 2008 and 2013, Russians' desire to migrate slowly increased, while approval of Putin's job performance slowly decreased," the report said. But in the 2014, migration desire plummeted to 7 percent just as Putin's approval ratings peaked at 83 percent after the annexation of Crimea and a successful Sochi Olympic Games. While the majority of Russians have been united in their opposition to Western sanctions stemming from the annexation, the punitive measures have taken a toll on Russia's economy, forcing the Kremlin to make some unpopular decisions regarding domestic finances. In September, for example, thousands of people across Russia joined protests against government plans to raise the pension age, despite promises by Putin to soften the unpopular measure. Toward the end of 2018, as Putin's job approval rating neared a half-decade low of 63 percent, desire to migrate rocketed to an 11-year high of 20 percent. In 2018, the report states, "12 percent of adults who approve of Putin's job performance would like to migrate," while some 40 percent of those who disapprove of Putin would like to migrate. Although the president used his annual State of the Nation address in late February to vow increased social spending and popular handouts in a bid to salve popular resentment over falling living standards, some observers have said the gesture may be too little too late. Gallup conducted the survey among 2,000 Russian respondents between June and October 2018.